We have an Ubuntu 12.04 LTS machines that is giving errors when I try to run updates. It therefore seems to me that sometime in the past, packages have been installed from there, but it has 'gone away'. If so, how do I identify and 'fix' those packages? Do I have to carefully go through the whole output from 'apt-get upgrade' and uninstall each one? Hope not, but if that's what's required, then okay. Medibuntu has now been shut down, the packagers were either obsolete, unnecessary or moved to the official Ubuntu archive. What this means? That you should remove the repositories from your sources.list to prevent errors and look for the packages you needed somewhere else or stick with the old ones that you have installed. I can't install libdvdcss - script not finding medibuntu, How to get DVD playback? The Medibuntu Project has come to an end - what do I do now? and then just comment out the line(s) that contain medibuntu. 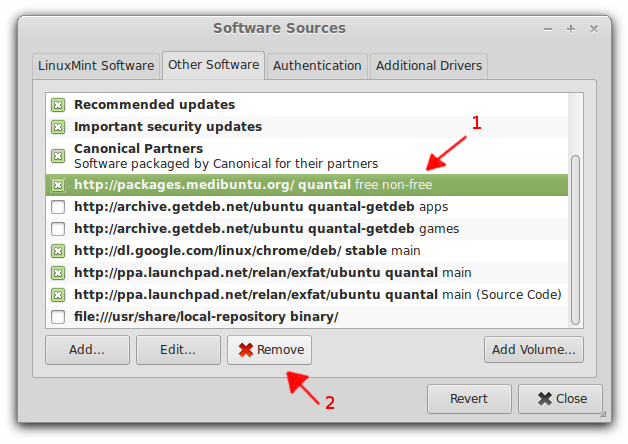 How to remove medibuntu repository and packages? What happened to the jockey-gtk command? What happened with SourceForge UbuntuZilla repository?